SAN FRANCISCO, October 1, 2018	(Newswire.com) - ​By 2021, the combined market size of augmented and virtual reality is expected to reach $215 billion USD, according to Statista. The same source also projects that the music market worldwide would increase to $43 billion USD by 2020. New developments in streaming, immersive music production tools and VR have paved the way for the merging of these two industries. 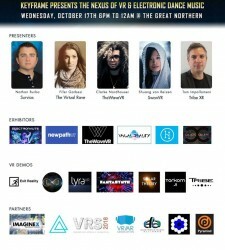 Known to most as video game DJ and remixer GRIMECRAFT, TheWaveVR Chief Evangelist Officer Clarke Nordhauser will also be presenting at the event. Earlier this year, TheWaveVR raised $6 million in venture funding for its social VR platform and community for VR music and visual arts experiences. In August, the company collaborated with Imogen Heap, the Grammy-award winning musician, in launching her social VR concert experience, hosted on TheWaveVR platform. TheWaveVR collaborates with artists across a variety of genres to bring social VR experiences to a growing community of people, helping them find new friends and discover new music and artists. The company is pushing the boundaries of VR, enabling new musical and visual experiences that currently do not exist anywhere else. "Electronic music events offer transcendental audio-visual immersion through digital technology. VR is the only medium robust enough to capture this art form in all its glory," states Fifer Garbesi. Shuang van Reizen of SwanVR is a VRtist experimenting with embodying flow and dance in alternative realities. Her global debut was from her "If You Want to ESCAPE with Me" Beat Saber video that went viral to over 100 million views. She collaborates with other developers and creators such as Android Jones in creating compelling videos to engage new people not familiar with VR. Julian Reyes, Keyframe-Entertainment CEO, states: "We're excited to showcase how VR enhances cultural movements, such as Electronic Dance Music culture. I see this event as a potential multi-city tour that nourishes growth for both industries. I also feel a continuing legacy from past events by ARTandVR, an organization that helps artists showcase their art and technology. I believe that we’re witnessing the birth of other similar events merging various sectors, such as sports and VR, education and VR, and health and VR, etc. We're honored to feature thought leaders at the nexus of dance music and VR, and to nurture developments in this cutting-edge sector."